After two years of our journey to get out of debt and pare down my expenses, my wife and I have found that we have mastered our budget. We have cut our grocery bill down significantly over the past year for our family of four, but we decided this week to one-up ourselves and menu plan for one week. I have read that menu planning saves hours of time, energy, money, and headaches, but I haven’t been interested in trying it until now. Our daily lives are about to get crazy, as I’m sure is the same for all of you readers. I love cooking, but it has fallen by the wayside over the past couple years. I love following recipes as long as the ingredients are at my fingertips, so the time is ripe for menu planning. 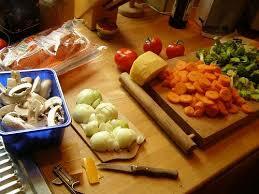 Menu planning is when you plan ahead of time what meals you’ll cook. Pretty straightforward, right? You can extract a grocery list from your menu choices. Because you buy only what you need, less food is wasted. You know exactly what you are going to eat for the week in advance. Cooking is more enjoyable because you are totally prepared. You’ll have an interesting menu for the week due to good preparedness. It’s healthier, since you aren’t going out to eat. It’s cheaper (you eat out less and you only buy what you need). Start by planning for one week only. Since we are experimenting right now, we are planning just a week at a time. We may go for two weeks if this works. I recommend menu planning at least a week at a time, and not going farther in advance than a month. This way, you’ve got enough menus planned to make it worth your while, yet not so scheduled that it becomes too big a chore. Right now, we are testing out different menus, hoping we find at least ten good meals to rotate. You can use Google Calendar to plan your menus – it’s streamlined with Gmail, so you can have it email your day’s menu and recipes each morning. My wife and I are simply using paper and pencil now. 1. We sat down and decided which meals we wanted to eat this week. I used the Epicurious app, since every recipe I clicked imported into a shopping list into my phone. 2. We went shopping for all the items in the shopping list on the phone. We spent much less money than we ever have for food in one week (about $150 as opposed to $200+). If you coupon, I am sure you can save more. 4. Lunches are left-overs from the previous evening! Breakfasts rotate between fruit, cereal, and oatmeal. We have some classic standbys that we make as sides – salads, steamed broccoli, kale, etc..
We only plan our dinners. Again, lunches are almost always leftovers. So far, menu planning is working out extremely well! We are thrilled at the money we are saving, too. We like eating very healthy; otherwise we could easily coupon, buy crappy food, and live on $60 a week…but screw that. We look at the extra money spent on food as investing in our health. Plus, cooking has become fun again! Please leave any menu planning tips you have in the comment section below! We need some advice!